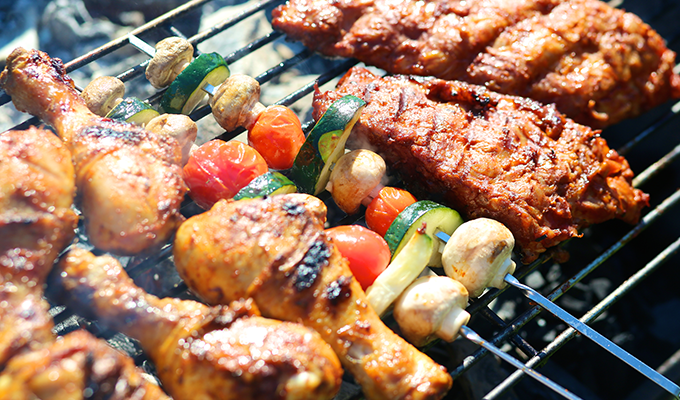 Have you ever heard that grilling or barbecuing foods can cause cancer? Well, as it turns out, there is some truth to that statement. Cooking protein-rich foods like meat, poultry and fish at very high temperatures - such as on a barbecue - does produce two cancer-causing compounds. The first are heterocyclic amines (HCAs) which form when amino acids (the building blocks of protein) and creatine (a natural compound found in muscle) react to the high heat as well as when the meat is overdone or charred (burnt). The second, polycyclic aromatic hydrocarbons (PAHs), form during a flare-up when fat and juices drip into the grill's flame or on the hot coals. The flame and resulting smoke contain PAHs which get deposited on the meat. The hotter and longer a meat is cooked, the more HCAs and PAHs will be produced. Most of the research on effects of these compounds has been done on animals, but it is possible that consuming grilled meat, especially when it is charred, can lead to an increased risk of cancer in humans. We don't yet know how many HCAs need to be eaten to increase cancer risk, or if everyone is affected the same way. Nor do we have recommendations for how many HCAs or PAHs can safely be consumed. Choose your protein wisely: Start with lean cuts of beef (tenderloin, flank steak, ground round) pork, wild game, chicken or fish. Trim visible fat and remove the chicken skin. Rethink processed meat like hot dogs and sausages that contain nitrates which may also form cancer causing compounds in our bodies. You can also try for plant-based proteins, like a veggie burger or tofu, which are less likely to form carcinogens at high heat. Marinate: Several studies have shown that using a marinade can reduce carcinogenic compounds. A 2014 study in the Journal of Agricultural and Food Chemistry found that marinating pork for four hours in black beer before grilling reduced PAH formation by more than 50 per cent. The reason marinades work this way is not clear. It may be because the marinade protects the meat from the direct heat or it may be something in the marinade ingredients. Acidic ingredients such as vinegar, lemon juice or orange juice, mustard, wine and even green tea have been shown to effectively reduce HCA formation while sugars or honey tend to char on the grill and thus be not effective. Spices such as thyme, sage, garlic, and rosemary have also been shown to reduce HCAs. Use store-bought marinades or make your own. Control the temperature: HCAs are created when meats are cooked at high temperatures, especially above 300 C, and even more so when the meat is charred. Turn down the burners, use medium heat and use just enough charcoal to give you a moderate, steady heat to cook until the appropriate internal temperature is reached. "Low and slow" cooking keeps charring to a minimum, but the longer cooking time can also lead to higher levels of PAHs and HCAs. Cooking the meat in advance in the kitchen can reduce the amount of time spent on the grill. Slicing meat into smaller portions or choosing quick-cooking options like fish and shrimp will also speed up the cooking time. Continuously turning meat over and frequently flipping those burgers can reduce HCA formation. Remove badly burnt or charred bits before eating. Prevent flare ups: Fat drippings cause flare-ups which can char and burn the food as well as create PAH-infused smoke. 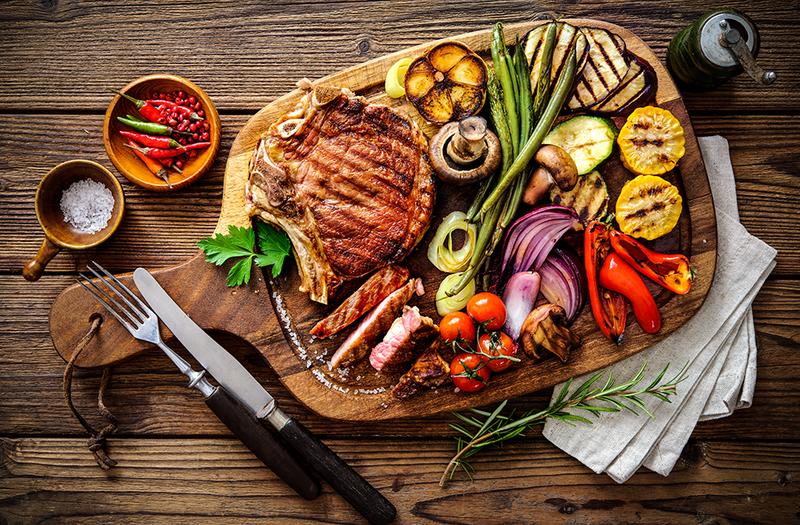 To prevent flare ups, start with lean meat and reduce direct exposure of the meat to an open flame by using indirect heat (cooking outside of the flame), or by using a grill pan, wrapping meat in tin foil or putting foil or cedar planks over the grill. Keep the grill clean. Add vegetables or fruit: Flavonoids in both fruit and vegetables are thought to block the formation of HCAs in meat and may be less prone to produce HCAs. Grill fresh zucchini, eggplant or even pineapple, peaches or nectarines for a naturally sweet side or caramelized dessert. Fruit and vegetables are also rich in phytochemicals which have a protective effect against cancer. Coralee Hill is a registered dietitian with Dial-a-Dietitian. You can speak to a registered dietitian at no cost by calling toll-free 1-877- 830-2892 or in Winnipeg at 204-788-8248. This column was originally published in the Winnipeg Free Press on Friday, June 8, 2018.